GW advanced on the Hoyas with screams and flags. Wow. Continuing a rivalry that predates humanity itself, students at THE! George Washington University challenged their Hoya counterparts to a snowball fight at Rose Park (26th and O streets N.W.) yesterday, and thanks to a muscular turnout, they have claimed victory. Now, we know much of GW students' animosity stems from the fact that their well-meaning relatives always seem to think they attend Georgetown. But we're hoping that the oh-no-maybe-MPD-will-bring-guns jokes were finally swept aside for this most unholy battle. Even GW University President Stephen Knapp showed up at this snowball fight, according to the GW Hatchet, and at the conclusion, he announced classes would be closed Thursday (to the herald of much rejoicing, we suspect). 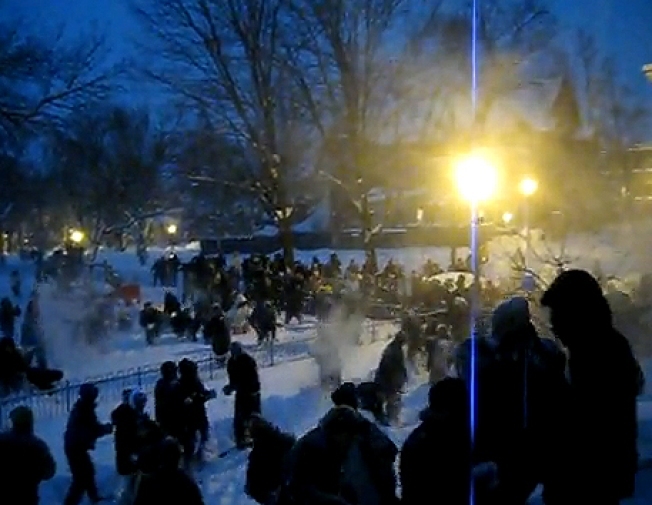 At the start of the fight, the severely outnumbered Georgetown crew immediately retreated over a fence and onto private property. It was here the majority of the fight took place, as GW students hopped the fence for close-range combat. Supposedly, the original throwdown challenge happened on Twitter, which is pretty much where everything happens these days. The actual battle was pushed back four hours, due to the fact that the world was pretty much ending yesterday afternoon. Although GW was the clear victor, it's still gonna take about 40,000 tons of salt to quell this rivalry once and for all.